Does God control your life? Does he control all that happens to you or only certain aspects of your life? Can you full trust him, leave everything to him and live without fear? In this essay, we will examine whether God controls our lives and the best way to secure his help and protection. .
Few years ago, a movie was made in India about the implications of blind faith and superstition. In the movie, the protagonist, who is an agnostic, files a case against God in a court of law claiming compensation for the damages he suffers from an earthquake. His argument was, since the earthquake was an act of God, God was responsible for the loss. Therefore, he should be held responsible for it, and he must compensate him for it. Although, outwardly the movie seems to raise an important question about God's role in our lives and present an arguably good viewpoint, on further examination you will realize that it grossly misrepresents the idea of God in Hinduism and his role in our lives. God in Hinduism is a complex Being and has many layers to him. According to the Vedas, the Supreme Being (Isvara Brahman) is not a mere controller. He has numerous aspects both at the microcosmic and macrocosmic levels. He is indefinable and indescribable. Therefore, he is indeterminate and cannot be defined or formulated into a definitive concept. As the supreme Lord of the universe, he is just like the head of a large family (vasudhaika kutumbam) or the CEO of an organization, who performs many functions and controls the overall progression of life upon earth. He is rarely seen, but his influence is always felt. For the order and regularity, he not only performs many functions on his own but also delegates most of them down the line to everyone who is part of his creation and part of himself. Thereby he ensures that everything runs smoothly here and above. The questions which we have raised before at the beginning of this discussion are simple but difficult from both philosophical and religious perspective. In Hinduism, you will find conflicting answers to them. On the one extreme you will find that God is the controller of everything. Nothing happens without his will or order. As one popular saying goes, without his permission even an ant cannot bite. He is the chief ordainer who through Brahma determines the fate of each being at the time of his or her birth. Hence, he is also the ordainer of fate (Vidhata). On the other extreme, you will find that God does not play any active role at all in our lives. He remains a passive witness (sakshi) in the background, detached, aloof and indifferent, and enjoying all that which we experience. All the functions in creation are carried out by Nature according to predetermined laws. Caught in her Maya, beings remain bound to the cycle of births and deaths, until they achieve liberation. Even on the path of liberation, God remains a passive witness, while devotees have to depend upon themselves or their gurus for liberation. What is the truth? In which of the two views shall we believe? The answer again depends upon your perspective of God, and how you look at him. The truth probably lies somewhere in between. God is both active and passive. He is the controller. At the same time, he is also benevolent, and gives us a lot of freedom to make decisions about our lives and respond to events according to our discretion. Most importantly, he goes according to your expectations and aspirations and becomes what you intend him to become. Before you want to know how far God controls your life, you should examine first how far you can control it on your own. Are you in complete control of your life? If not, how much influence you think you can exert on your life and destiny? True, you have been endowed with certain abilities and choices to pursue your goals and fulfill your desires. However, it is also true that you are helpless against the forces of Nature and of the world, and have to make many compromises to ensure your self-preservation. Outwardly it may seem that you have some control over your life and actions, but on close scrutiny you will realize that a substantial part of your life is not under you control at all. Things do not always happen according to wish and your will. Many a time you have to put up with people and things with whom you do not want to associate and have to make peace with them, whether it is in your interest or not. Many people lead unhappy lives because they cannot control what happens to them, or how they want to live. You also have to depend upon others and many external factors to survive in this world and avoid trouble, conflicts and suffering. If you carefully examine your life you will realize that it is shaped and controlled by three primary forces, which are stated below. They are common to all. You may make provisions to secure your life against them but cannot completely avoid them or escape from them. In Hinduism, we call them Adhyatmika (self-induced), Adhibhautika (caused by the world) and Adhidaivika (caused by God) respectively. Your suffering and much of what happens to you arise from them. You. It includes your physical and mental abilities and what you can or cannot do. Others or the World. It includes Nature, people other beings, worldly objects, possessions, etc. Acts of God, chance or random events. It includes any unforeseen, unpredictable and fortuitous event which cannot be attributed to either of the above. The three factors are further influenced by your karma. It means that even for the acts of God, and the actions of others, only you may be ultimately responsible since they may manifest in your life according to your past deeds. According to the doctrine of Karma desire ridden actions have consequences. You reap as you sow. Hence, beings suffer in the mortal world, according to their actions (karma), and remain bound to the cycle of births and deaths until their karma is completely exhausted. What it means is that much of what happens to you in your life is self-created, be it the interference of others or the acts of God. In other words, we may be overemphasizing the importance of God in our lives and unnecessarily blaming him for the suffering we experience, as the protagonist in the movie, ignoring our own culpability in creating it. The scriptures say that God is indifferent. He has no desires and attachments, likes or dislikes, nor has he any desire to do or not to do anything. If you do not want him to be part of your life or if you choose to ignore him completely as the atheists do, he will remain silent and let you be on your own. He will let you enjoy life or suffer from it according to your actions (karma). However, if you want him to be a part of your life, you must actively seek his love and grace. You must invite him into your life and ask him to help you, guide you and protect you, surrendering your will and renouncing your desires, egoism, attachments, ownership and doership. You cannot blame him if you have never given him any chance to help you or enter your life, or doubted his very existence. Any one who loves you unconditionally does the same. They become silent, if you want them to go. They do not demand, but always give you what you want. If you want God to enter your life, you must sacrifice yourself or step aside, as if you do not exist and do not matter. This, indeed, is the essence of renunciation in Hinduism. You give up who you are, to be with God. When you are so full of yourself, with your interests, desires, goals, relationships and priorities, how can you blame God for what happens to you? There cannot be two persons in the same body. It is either you or God. It is up to you to decide whether you want to keep God outside or inside your house, and whether you want to exercise your will or surrender it. This is the truth. If you want God, you must let go of what is not God. You must give up yourself and allow God into your life, opening your mind and heart to him. As Arjuna did in the Mahabharata, you have to make him the charioteer of your life. True devotees who secure his help surrender to him, worship him with devotion, give him the reins of their lives, develop complete trust and faith in him and let him be the Lord and Master of their destinies. To be always in his company, they subdue their egos, renounce their selfish desires and attachments and unconditionally surrender their will to him. For most people, this is not possible. Hence, their relationship as well as their communication with God remains impure, imperfect and incomplete. God has two aspects, the individual Self (Atman) and the Supreme Self (Brahman). As the individual Self, he is a part of your life, and as the Supreme Self, he is part of the whole creation. As the individual Self, he does not control your life at all unless you surrender your will and hand over the reins of your life to him. Until then, he remains in the background and lets you control your life and destiny. In that ignorant state (ajnana), you will be subject to the laws of Nature and remain deluded, ignorant and bound to the cycle of births and deaths. If you worship God with selfish desires, he may still respond to your prayers according to your faith, but you will be still subject to karma and rebirth. 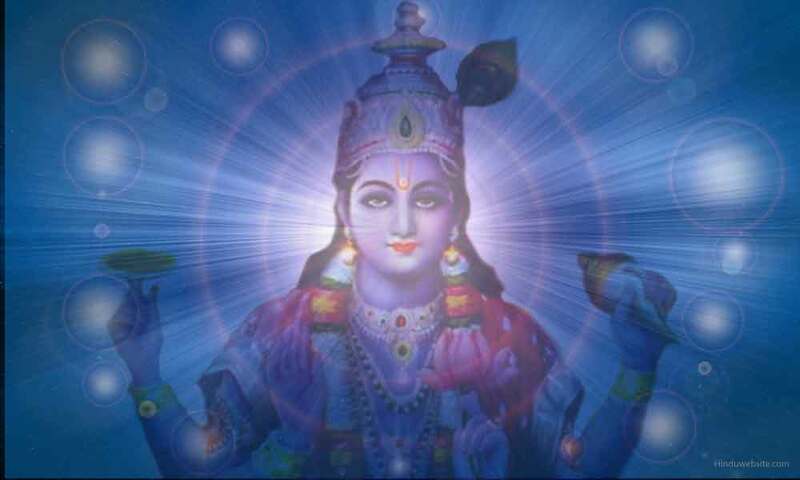 As the Supreme Self, God is the Lord of the universe (Isvara). In that role, he controls every aspect of creation, engaging in five actions namely creation, preservation, concealment, revelation and destruction. The Vedas state that by the power of his own Maya or Nature (Prakriti), he brings forth the worlds and beings, establishing the laws of Dharma to govern their progression through the Time cycle. However, he does not have any particular interest in what he does. Therefore, he performs his duties rather indifferently to ensure the order and regularity of the worlds. However, he also assigns those functions or duties and responsibilities to various entities in different worlds and makes them responsible for their execution. Individual karma arises from the obligation the beings have towards the Creator. They are rewarded or punished according to their commitment to those obligatory duties. If they ignore them, the world will fall into chaos, which may necessitate God to directly incarnate upon earth to restore order. From your personal or egoistic perspective, God (adhidaiva), the world (adhibhuta) and you are independent entities and exist outside you. Until you identify yourselves with them, they remain separate, and you remain bound to your distinct name and form. However, from the unified perspective of God you are not separate from him. Since he is omniscient and omnipresent, you are an aspect of him, just as everything else in creation is. Just as the waves are not different from the ocean, you are not different from Brahman. Hence, although God remains passive and does not directly control the beings, from his universal perspective, he is still their controller and responsible for all that happens to them. Whether the actions are performed by them or by him, he is their source and support. As an individual, you may take credit for your actions and assert your individuality, but from the transcendental perspective you are an illusion while God is the only reality. "Those who know me as the Master of elements, master of divinities and master of all sacrifices, they of steadfast minds know me even at the time of departing from here." The Supreme Being of Hinduism is not a judgmental God, who micromanages everything and everyone. He rules the worlds through set laws, while he remains in the background, allowing us lot of freedom to use our will or use discretion to make our own choices and pursue our goals. In the Bhagavadgita, he clearly states that in whatever way people approach him or worship him he strengthens their faith in that direction. Even when they worship others, it is he who grants their wishes. The decision to worship him or ignore him also rests with you. If you ignore him, he may not punish you, but you may lose his support, guidance and help as he may remain aloof and may not interfere with your life or your actions. However, those who indulge in evil actions and cause suffering to others are not spared since it is God's universal duty to uphold Dharma. He punishes the wicked ones according to their deeds when the situation goes out of control. As for the others, he lets the law of karma determine their fate. The initiative to worship God and seek his help must primarily come from you. You must actively seek his help and guidance and attract his attention with devotion and faith. The Bhagavadgita affirms that God reciprocates the love and devotion of his devotees. He takes care of the lives of those who are forever absorbed in his contemplation, having given up egoism, desires and selfishness. The Puranas also contain many references to God’s mercy, and how he rescues his devotees from grave difficulties. "He who remembers me constantly and uninterruptedly, without any other thought, for that reverent yogi who is ever absorbed in concentration, O Partha, I am easy to attain." What is Karma in Hinduism?